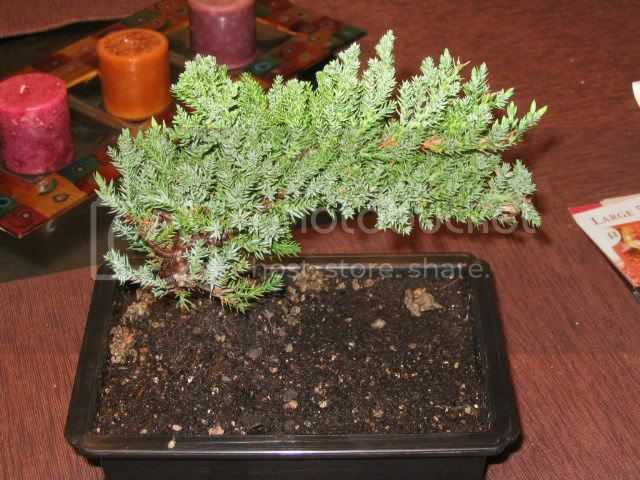 I have just recieved a juniper bonsai as a gift. I have been interested in them for a while, just wasn't sure what species I wanted to buy. The Juniper I recieved seems pretty healthy, it has a few brown spots on the lower branches. It has some sort of gravel glued(i think, its stuck pretty good) to the top of the soil, I have read this should be removed? Is it better without the Gravel? Also, I live in a condo with no balcony, I really have no place outside for the tree, I do have a solarium, or sunroom which is cool(65-70deg)in the winter and gets lots of light. I know the tree won't go dormant in this temp, but will it survive? Should I be using artificial light? Here is some pics. I just removed the glued rocks and noticed there is a few roots exposed around the trunk, is this ok? One of the lower branches of mine was browning but I think all seems to be ok. So, i wouldn't worry about it too much. on junipers. Also, try a book. I recently got 'ortho's guide to bonsai' at borders books in my town. There's quite a bunch there, surprisingly. Sorry to be the bearer of bad news but Juniper is one of the least appropriate species for indoor culture. Artificial lighting might help in the short term but without a proper dormancy period, even with your cool room, the tree will almost surely decline and eventually die. It is good the rocks are off they just interfere with watering and perhaps more importantly judging when to water. I know that you are going to try to manage it anyway, what choice do you have other than give it to someone else. Even so, if it has not been acclimated to the approaching cold weather putting it outside now may not be wise. If you are truly interested in indoor bonsai (it sounds like you have a good space) might I suggest you look into some tropicals, perhaps Ficus. They are a good tree for beginners, you can expand your collection from there. A good book for indoors is "bonsai in your home" by Paul Lesniewicz. Here is a link concerning indoor culture. This is my first post. I just received a 6 year old Juniper Bonsai as a gift. This is my first Bonsai EVER. The fellow selling it said it was a good begginer tree, easy to take care of, etc. Can this tree be left outside during the winter? I live in Maryland and the temperatures can get in the teens (F) during the coldest part of the winter. I have a porch that faces South, so it gets full sun all day. Thanks for any advice, and help for my new hobby. The fellow selling it said it was a good begginer tree, easy to take care of, etc. Junipers are fairly easy to manage providing you are aware of their cultural requirements. Foremost, this species is not really suited for indoor culture. They may seem OK for a time but more than likely will gradually decline unless you are able to provide conditions that simulate their outdoor environment. Your home is simply too warm and too dry for Junipers to do well. They need a dormancy period in the winter to thrive. Can this tree be left outside during the winter? Yes, in fact it is all but a requirement. I live in Maryland and the temperatures can get in the teens (F) during the coldest part of the winter. Junipers are very hardy and these temperatures are not usually a problem. The real issue is that if your tree is not acclimated to cold weather it may not be advisable to put it out now. Starting next spring it should begin its new life outside and remain there. I have a porch that faces South, so it gets full sun all day. By all means take advantage of it place the tree on the porch when temperatures permit. You are South of myself and even further South than Tony. A large box or bushel basket can be used to place the smaller pot in. Provide some insulation, leaves, packing peanuts, Etc. up to the rim of the smaller pot. This will probably be sufficient for all but the coldest days. Don't forget to monitor the moisture in the soil. It will not need watering all that frequently but should not be kept terribly dry either. Again I would like to emphasize that I am being overly cautious because I don't know how the tree has been managed recently. This much caution should not be necessary once the tree has been allowed to spend the entire late Summer and Fall outside. Pretty funny how many people got early Christmas gifts in the form of a Juniper bonsai Thank you for your quick and informative response. The guy my wife purchased the tree from had bought it from a nursery in Virginia, so I am thinking the tree was outside, not in a store. Right now it is 48 in my porch, so I will probably leave the tree outside tonight. Do you think this will be long enough to acclimate it? Well, obviously not overnight but it is supposed to be "mild" for the next week, at least. Last edited by USMC1968 on Sun Dec 24, 2006 2:56 am, edited 1 time in total. I'd like to see! Welcome! Here are a few pictures I just took. Go here: http://imageshack.us/ "Browse" to the location on your PC where the image resides then click the "Host it" button. After the file is done uploading choose the appropriate image code from the list, "thumbnail for forums" is good. Left click on the code to highlight the code then right click and COPY the code. The guy my wife purchased the tree from had bought it from a nursery in Virginia, so I am thinking the tree was outside, not in a store. Right now it is 48 in my porch, so I will probably leave the tree outside tonight. Do you think this will be long enough to acclimate it? Well, obviously not overnight but it is supposed to be "mild" for the next week, at least. If the tree recently came from a decent nursery and has not been on truck and then on a store shelf for weeks it stands a much better chance of making it through the winter. By all means leave it out. Here are the links to the first pictures of my new little lttle one. I left the guy outside last night, it only got down to 42. I will foloow your advice about putting him in a larger container surrounded by insulating materials for the rest of the winter, just in case. Hope you had a safe and happy holiday season. In one of your posts you mentioned that you have your Bonsai planted. Perhaps I was not clear in describing my situation. I purchased this tree this past spring a little too late to re-pot. It is simply over-wintering, out of the pot, in the garden. This saves me from worrying about the roots being damaged due to drying out or excessively cold temps. Even Junipers are more vulnerable to low temps if in a pot. I intend to re-pot it this Spring, removing all of the old nursery mix in the process. In fact I prepared my new mix tonight. Starting to get anxious already. Should I plant my Juniper in the Spring and take it up every so many years to trim the roots? That is a possibility but not a necessity. It depends on if you are satisfied with the overall size and development of the tree as it is now. One a tree is in its bonsai pot, rapid development is ended and you are essentially just refining and maintaining the tree. Young trees that are to be grown out more are often planted in the ground for years to thicken up. It depends on your vision for this particular tree. Do you see it as being in its refinement stage or still developing? Thanks for your response. In all honesty I do not know what I want. This is my first Bonzai so I do not have a clue. Right now the tree looks nice, but it would look "older" with a thicker trunk. Right now the tree is sitting in my front porch outside that gets full sun all day. I put it in a small box that goes to just above the top rim of the pot and filled it with packing peanuts to the rim. This should keep it relatively comfy I think, without freezing the little one. I guess in the Spring I will repot it and see how it does. Should the root ball be trimmed out everytime it is repotted? Thanks again and sorry for the barrage of questions. Thanks again and sorry for the barrage of questions. In all honesty I do not know what I want. 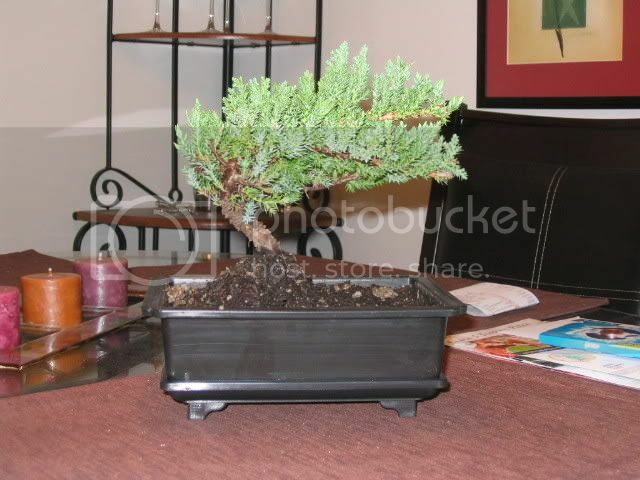 This is my first Bonzai so I do not have a clue. Right now the tree looks nice, but it would look "older" with a thicker trunk. The only way to thicken the trunk is to allow unrestricted growth, which means that you will essentially loose what you have now and start from scratch. Since this is your first tree why not simply work with what you already have and use it as a learning opportunity. Learn how to manage it properly and about soils by re-potting in the spring. Should the root ball be trimmed out everytime it is repotted? 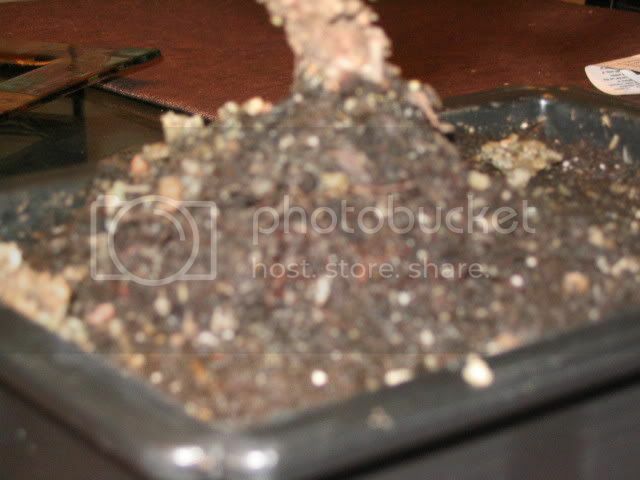 If you plan on re-potting please do some research into proper soil. You can build your own or purchase it ready made but what ever you do do not use standard potting soil. These trees need to be in a very free draining mix that water just runs through. Dense, peaty soil is probably responsible for the sad condition that many people find there Junipers. 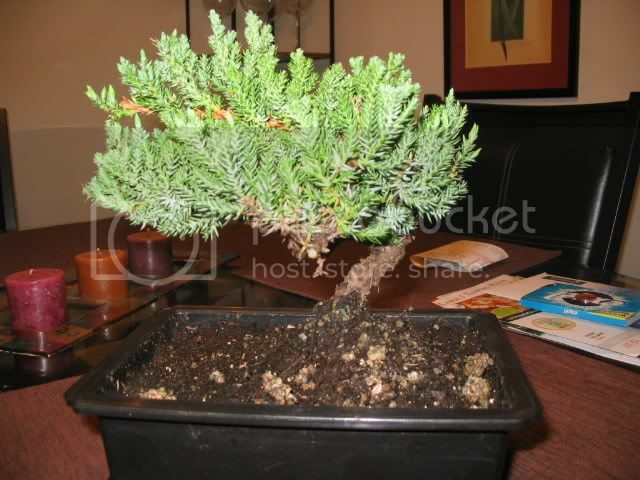 Possible for Beginner to Make a Juniper Bonsai From Seed?